I released my first app online which is currently serving as a sub domain on my personal blog vickythegme. I happen to read about twitter api past these days and got pretty much interested to it that I wanted to build an app on my own. The first idea that I got is to bring up an app that would let users follow and unfollow (a simple twitter management tool similar to JustUnfollow, Unfollowers.me etc.,). So, the simple app that I am talking about is none other than Longertwits – http://longertwits.vickythegme.com which is most inspired by Amit Agarwal’s talltweets. I used to use talltweets back then to tweet if I need to send more than 140 characters and some day decided why not write a similar app on my own. Once I started, I felt pretty good that I made an app (with some errors though ;) ), I started to work on the reducing the errors that could possibly happen and let the users use it as well. So, here I’m sharing my first twitter app. – Longertwits. I could see so many apps that use these features and not one of them having all the three.! With respect to that, I added these 3 options to tweet to your twitter account. 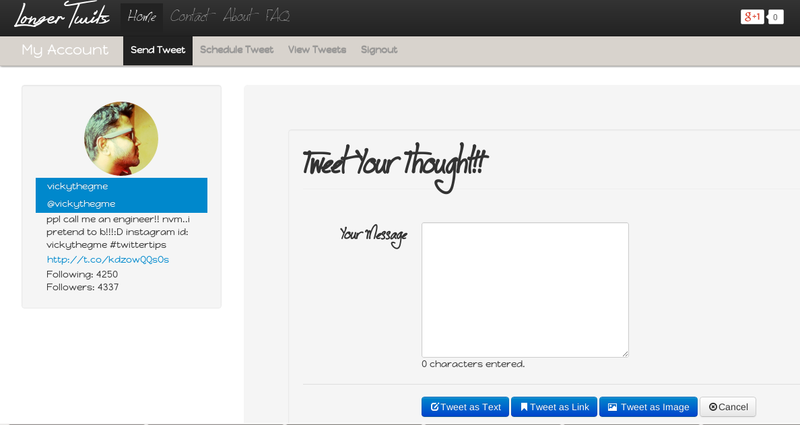 This option lets you tweet your message in the form of text. If an user types a tweet message that is more than 140 characters, the app splits the first 140 characters and sends it first and then sends the next 140 characters and so on. Tweet as Link option lets you tweet a text message which is more than 140 characters as link. This means that the tweet is sent with a link such that it shows some first 40-60 characters and add a link to the tweet that is saved in our db. This option could be very useful if someone wants to mock up an essay of something or an announcement or anything that will relate to the limit. 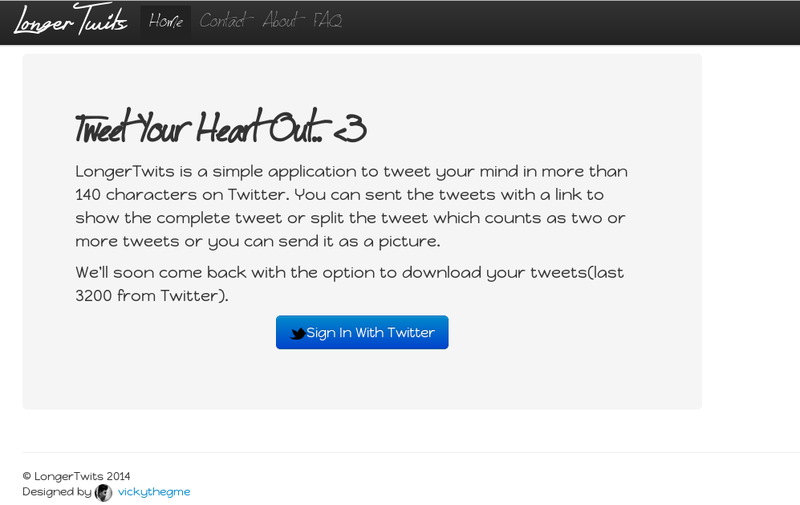 Tweet as Image is one option that is mostly inspired with the idea of talltweets which I wanted to make it available to longertwits app as well. This option lets you to send the tweet text in the form of an image. The Images above are the old design with bootstrap 2 and I will be changing the app with the new bootstrap 3 design real soon. I could not say anything more than just ask you to try out this simple app Longertwits and do let me know your feedback below in here as comments or you can ping me up on twitter -@vickythegme or anywhere you feel convenient. What about TweetBeeg? This is better than talltweets because it is more complete. Add it to the post and also another one.